General : These terms and conditions of business supersede all previous terms and conditions of sale. The placing of an order implies acceptance of the most up to date terms and conditions. The prices are determined not only by height but also width in centimetres, which range in size from XS 20-30 cm to XXXL 81-90 cm. The width indicates the widest point of the plant usually the base i.e. a 40 cm XS cone will have a height of 40 cm and a width of 21-30 cm and a 150cm XXXL spiral will be 150 cm tall with a base coil width of 81-90 cm. During the hotter times of the year normally May to September we can only offer potted stock due to risks incurred when lifting. Note although our container stock is ever increasing we will not have the full range in the summer but winter orders placed before September will receive a 10 % discount. We do supply different varieties of Box and are able to source other forms of quality topiary. Prices : We reserve the right to change prices without prior notification. Availability : All items listed, or quoted for, are offered subject to availability at the time of firm order. All sizes quoted are approximate. Delivery : Delivery can be arranged by our own transport or by specialist carrier, each at cost. The purchaser must have someone available to check receipt with our driver. Off loading is the responsibility of the purchaser who must have capable labour available to receive goods. Payment : All payments can be made by cash or cheque payable to Bellamont Topiary. New customers are required to make payment on or prior to collection or delivery unless other arrangements have previously been made. Payment for formalised account customers shall be paid in full 30 days following the date of invoice. Thereafter an additional charge of 2% will be added per month due on the amount outstanding, payable with the principle sum owing. This is not to be construed as an offer of credit. 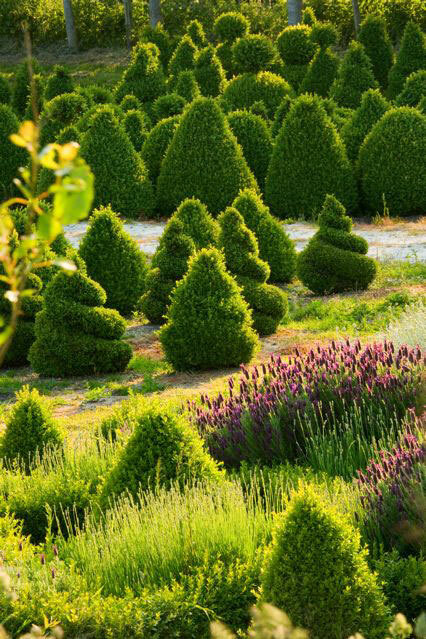 Plants remain the property of Bellamont Topiary until payment has been made in full. Quality : Every effort is made to ensure that our trees are top quality, true to name, and they leave our nursery in first class condition. However, as we have no control over the stock once it has left our hands, we give no warranty, express or implied, after delivery or collection. Complaints : All consignments must be examined on receipt or collection and any complaints must be made with in two days. Our responsibility for stock supplied is limited to its replacement or at our option, a refund of the price paid.